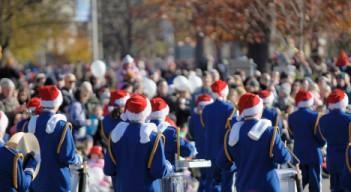 Picking a Christmas parade theme for your community or club can be difficult. Annual events become challenging to plan year after year. Suggest some new ideas for this year's parade to keep things interesting. Whether you are putting together a parade for the entire community or just your daycare playgroup, it helps to have a few thematic ideas. This will give the parade entrants a jumping point for their own ideas and provide a cohesive look to the entire Christmas holiday event. Plan a parade around beloved holiday characters. Traditional figures, like Frosty the Snowman, Rudolph and gingerbread men may all end up in the parade together. Alternatively, characters may be contemporary figures that are dressed for the holiday, like the famous television and movie characters in the Disney World Christmas Parade. While today's Santa dons a red suit with a big belly, the Father Christmas figures from around the world and across the centuries are more diverse. Have each parade entry depict a different look for Father Christmas, based on their imagination or historical fact. Have you ever wondered what the North Pole would be like? Kids of all ages like to imagine what goes on the night before Christmas. Entries may depict the reindeer in their barn, Santa in his workshop or elves asleep after their work is finished. This fantasy theme is perfect for a lighted parade. Christmas Stories: Each parade entrant picks their favorite book or film to portray on a float. Green Christmas: Parade entrants highlight eco-friendly Christmas ideas. Parade of Trees: Floats need to depict different and outrageous Christmas tree decorating ideas. Winter Wonderland: Snow and more snow is the main message of this theme. Holiday Sports: Skiing, ice skating, sledding, snowboarding, hiking and snowmobiling are all perfect subjects for this parade theme. Biker Christmas: Area motorcycle clubs may relish the idea of getting their bikes decked out in the spirit of Christmas. Forest Friends: Penguins, polar bears and moose all brave the chilly weather, so feature them in a Christmas parade. Christmas Candies: Floats that show taffy-pulling, bands dressed as candy canes and marchers handing out popcorn balls are all great ideas for a candy-themed parade. Musical Madness: Require each parade entry to have some sort of musical aspect, whether it is a live person playing a Christmas carol on their trumpet or a float with 20 Elvis impersonators lip-synching the classic tune Blue Christmas. To come up with more parade themes than the ones listed here, brainstorm with your club or committee several months before the parade theme needs to be chosen. If you cannot come up with any ideas within your group, put a notice in the paper that you are accepting ideas for the parade theme. Public members may send in ideas that are perfect for the next Christmas parade. If you have ideas for holiday parades, please post them below!